Habit: Annual, perennial herb, or +- woody, generally glandular-hairy. Leaf: simple to compound, basal and cauline; cauline alternate or opposite, stipules 2, +- on stem. Inflorescence: cyme or pseudo-umbel or 1--2-flowered. Flower: bisexual [unisexual], radial or +- bilateral; sepals 5, free, overlapping in bud; petals generally 5, free, generally with nectar glands at base; stamens generally 5,10; staminodes scale-like or 0; ovary generally 5-lobed, upper part elongating into beak in fruit, chambers 5, placentas axile, style 1, stigmas 5, free, persistent in fruit. Fruit: septicidal [loculicidal], mericarps 5, dry, generally 1-seeded, each persistent on 1 of 5 linear segments of beak that separate from central column by curving or coiling upward. Genera In Family: 6 genera, +- 750 species: temperate, +- tropics. Some cultivated for ornamental, perfume oils. Habit: Annual, perennial herb, often +- glandular, especially above. Stem: generally 1--4 mm wide in lower 1/2. Leaf: palmately lobed to divided, +- hairy; segments generally palmately lobed and/or toothed; upper alternate or opposite; blade generally round in outline, base generally cordate. Inflorescence: (1)2-flowered. Flower: radial (+- bilateral); sepals +- awned to mucronate; stamens 10, outer 5 opposite petals (lacking anthers in G. pusillum), inner 5 alternate petals, nectary glands 5, alternate petals. Fruit: mericarp generally ovoid, dehiscent, 1-seeded; basal callus generally present, often with long bristles. Habit: Perennial herb. Stem: erect, 1.5--9 dm; hairs +- soft. Leaf: blade 4.4--11.3 cm wide, divided 0.75--0.9 to base, segments 5--7, rhombic. Flower: pedicel 15--30 mm; sepals 7--8 mm, smooth, awned; petals 14--20 mm, rounded, white, generally purple-veined, 1/3--1/2 hairy adaxially; nectaries woolly abaxially. Fruit: mericarp 3.5--4 mm, smooth, hairs sparse; beak 13--17 mm, narrow tip 1--2 mm; stigmas 3--4 mm. Seed: coarsely pitted. Chromosomes: 2n=52,56. 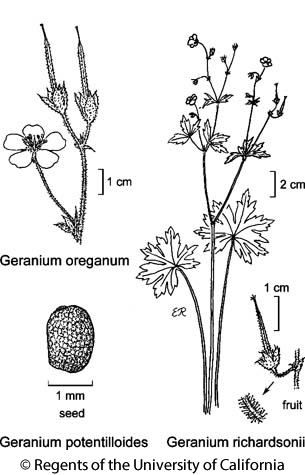 Citation for this treatment: Carlos Aedo 2012, Geranium richardsonii, in Jepson Flora Project (eds.) Jepson eFlora, http://ucjeps.berkeley.edu/eflora/eflora_display.php?tid=26741, accessed on April 19, 2019. SNH, TR, SnJt, Wrn; Markers link to CCH specimen records. Yellow markers indicate records that may provide evidence for eFlora range revision or may have georeferencing or identification issues. Purple markers indicate specimens collected from a garden, greenhouse, or other non-wild location.